With the goal of making integrity everyone’s concern and part of daily life, the Integrity Initiative - spearheaded by the Makati Business Club, the European Chamber of Commerce of the Philippines (ECCP), the American Chamber of Commerce of the Philippines (AMCHAM), the Management Association of the Philippines (MAP), and Financial Executives of the Philippines (Finex) - is staging a historic run on December 12, 2015 at the CCP Complex, Pasay City. Dubbed “I RUN for Integrity: I am Part of the Solution,” the event calls on all sectors of society to participate in this important step towards building a culture of integrity in the Philippines. 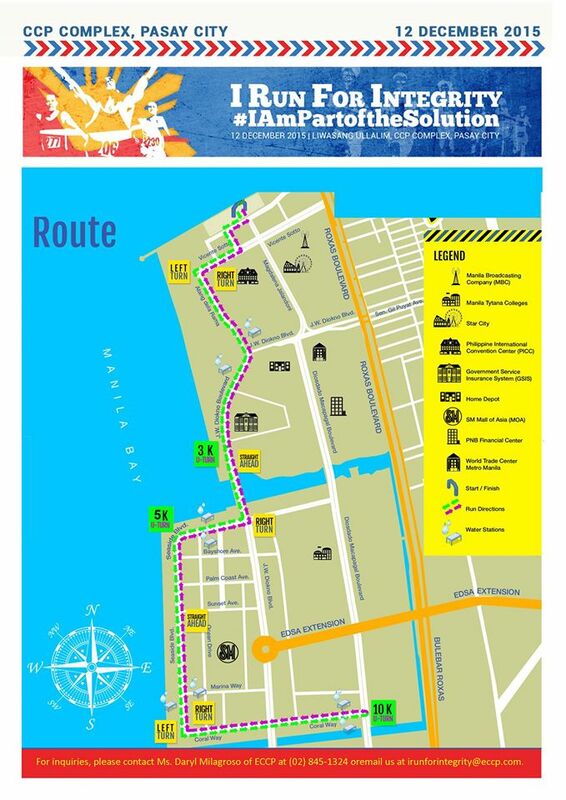 It is expected to bring together 5,000 representatives and runners from government, business, youth, civil society, academe, church, and media towards the common goal of being part of the solution in fighting corruption. “While the Integrity Initiative has already accomplished notable milestones, there’s still a lot that needs to be done. One of which is to encourage more engagement from individuals, especially the youth, to act with and uphold the value of integrity. 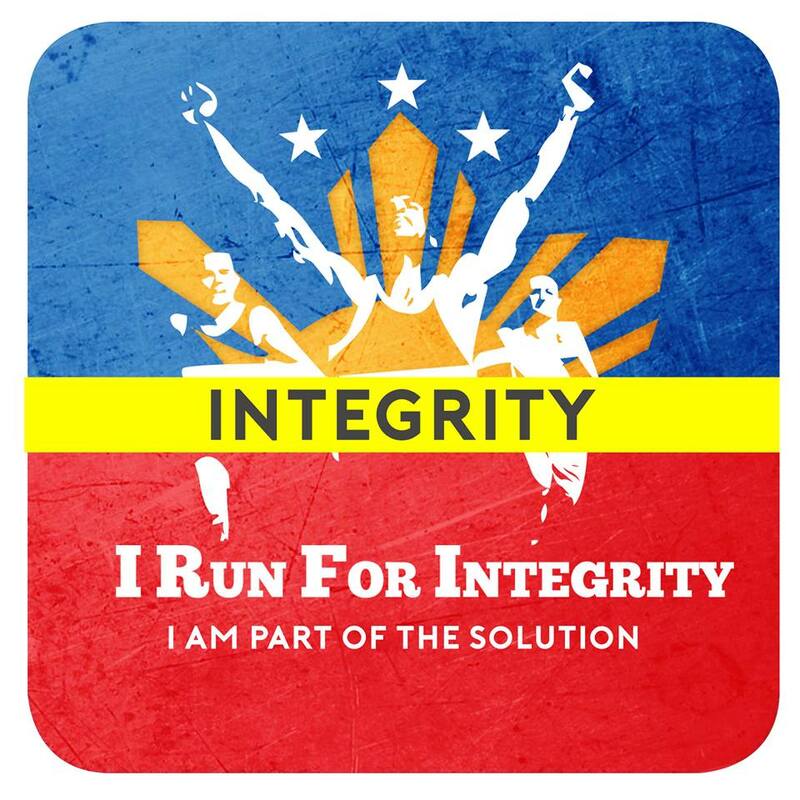 This is why the theme of this year’s run is ‘I RUN for Integrity: I am part of the solution.’ The individual acts of integrity are sure to deliver remarkable collective result in the long run. 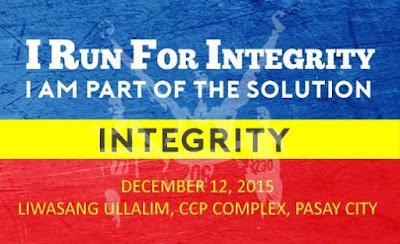 Participating in the run event is a symbolic gesture of pledging to act with integrity,” said Henry Schumacher, Vice President of ECCP and the Integrity Initiative, Inc. “We expect this event to be another show of force by Filipinos from all walks of life who want to finish victorious over our fight with corruption. With this event, we seek to make integrity everyone’s mission,” Schumacher added. Runners for the “I Run for Integrity: I am Part of the Solution” can choose to participate in the 3K, 5K, and 10K categories. Registration can be made at Chris’ Sports branches in Glorietta 3, Mall of Asia, Market! Market! and SM Megamall until December 4 only. 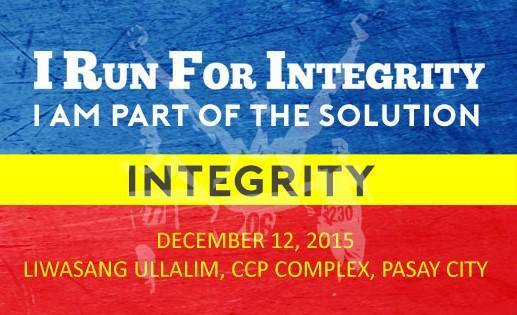 Late registration is until December 7 or until race kits last at the ECCP office in Makati. 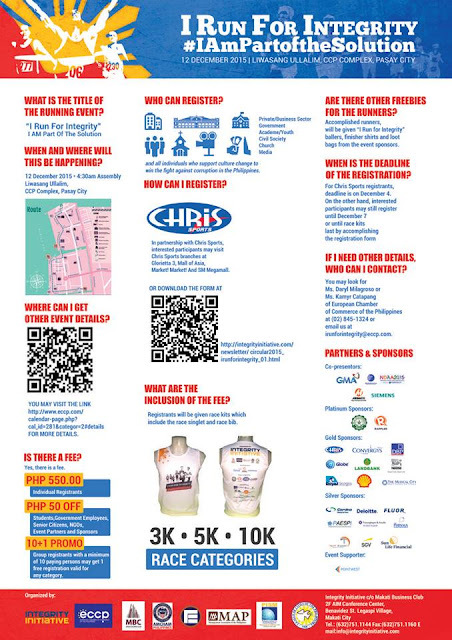 Accomplished runners get to bring home “I Run for Integrity” finisher shirt, baller band, and tokens from event sponsors. Special prizes also await top finishers of the event. 1.) P50 OFF – students, government employees, senior citizens, NGOs, event partners & sponsors. 2.) 10+1 – Group registrants with a minimum of 10 paying persons may get 1 free registration valid for any category.